Our time in Budapest had come to an end and it was time to move on to our next adventure. If you have read my earlier blog about our New Years trip to Vienna, you will remember that our trip ended on a not so pleasant note – specifically, a case of food poisoning. Due to that incident, we missed out on almost all of the touristy things in Vienna due to me having to stay trapped in our hotel room until we left. Flights to Budapest had been expensive, but I had found cheaper flights by doing an open jaw flight with Lufthansa and Austrian Airlines. By flying into Budapest and out of Vienna, the flights were 50 euro cheaper and we got to visit Vienna on a happier note. discovered that they were all Syrian and Afghan refugees, not Roma people. I feel humbled to have come face to face with the people who have nothing left to lose. It is easy to become distanced when reading about situations on the news, especially when it seems so far from home. 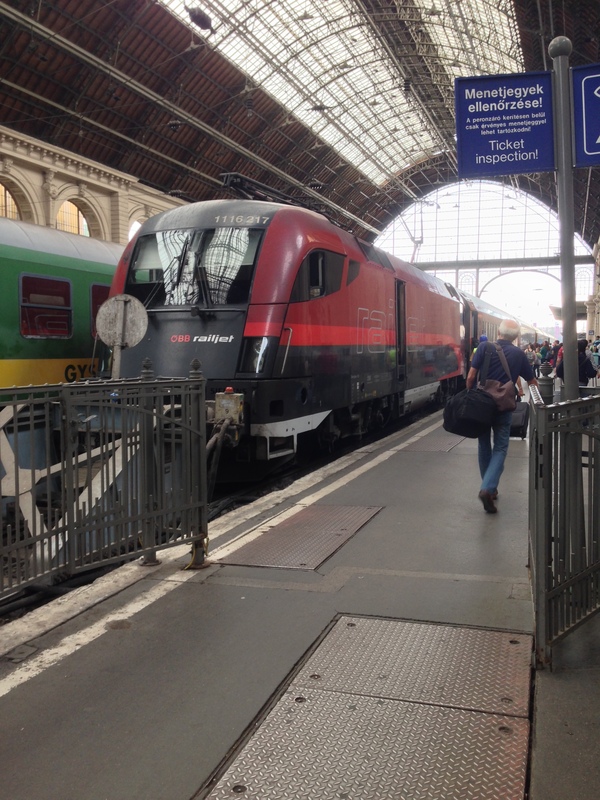 Our train tickets cost about 19 euro each and the journey was to take about three hours to Vienna. We were quickly situated in our booked seats and set in for our relaxed journey. As it turned out, I guess Hungary allowed refugees to pass through their country rather than stay there and look after them. To get to the bathroom you would have had to have stepped over families who were crammed in like sardines. I went to go to the bathroom at one point and a woman looked up at me with the saddest eyes while cradling her toddler who was sound asleep. I couldn’t bring myself to step over them, to treat a desperate woman and her child with such disrespect, so I went back to my seat. of the metro stations and head straight to the palace so that we could do the tour before it closed at 5pm. 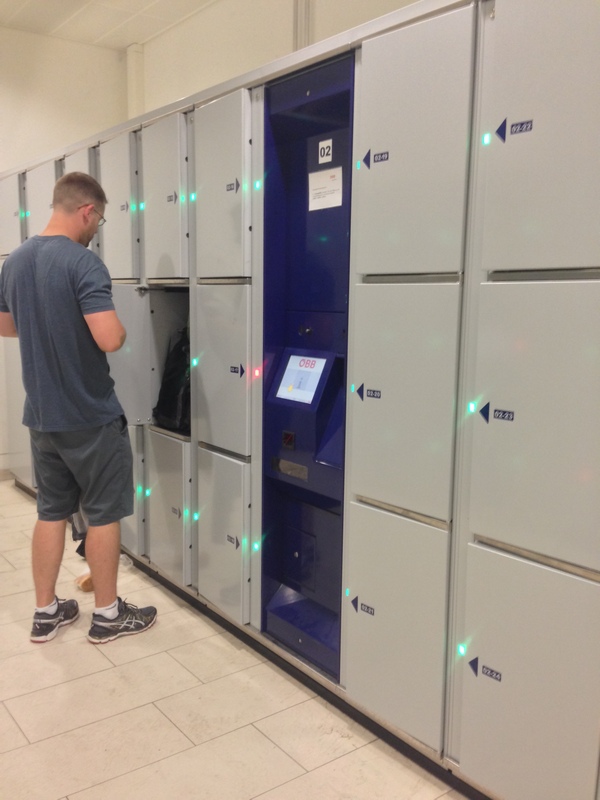 It sounds complicated, but left luggage storage turned out to be an awesome lifesaver in Vienna and we will definitely look out for that facility more during our travels now. It cost us about two euro to store all of our luggage (two hiking backpacks and two hand luggage sized backpacks) and that would have lasted us for 24 hours. We were already familiar with the Vienna underground system and its ease of use certainty didn’t disappoint us again. 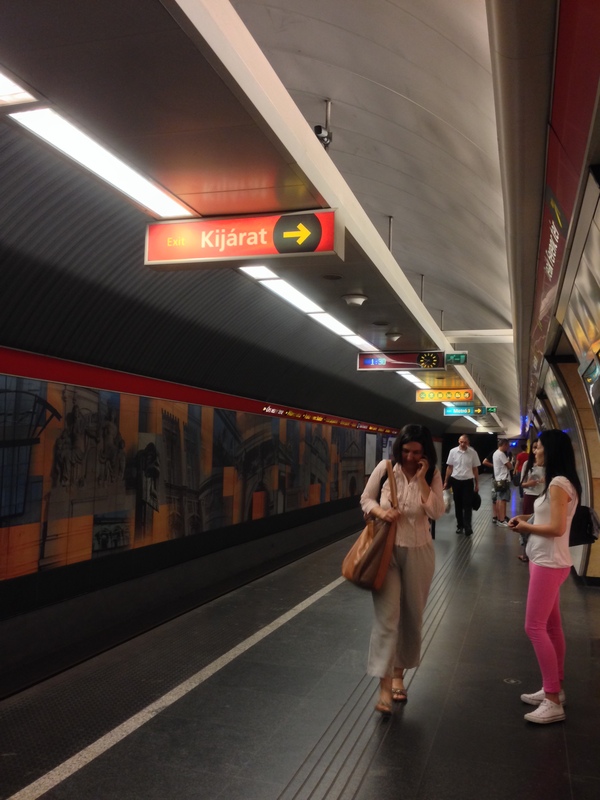 Within about 20 minutes we had reached our destination with only one change of line at Karlsplatz station. The palace did not disappoint. The Hapsburgs definitely had a beautiful sense of style that is evident throughout Vienna, but especially at Schoenbrunn. The beautiful weather in July helped to make it even more attractive. Despite being the middle of summer, Vienna was green and luscious and absolutely romantic. I know that Paris is the ultimate city of love, but there’s something about Vienna that makes me whimsical thinking about it. The tour of the palace was horrible. While you should do it to hear the interesting stories about the Hapsburg Empire and particularly the stories about Elisabeth and Marie Antoinette, it is absolutely uncomfortable so be prepared for that. One thing that Austria doesn’t do well is the limitation of numbers. The suffocating amount of people that we shuffled around with over New Years was equally as bad during the week in summer at this palace. I wrote a complaint at the end of the tour as it would be bad news if there was a fire or, worse, a terrorist attack. The art inside of the palace is stunning, particularly in the buffet hall area. Also I couldn’t believe the style of the rooms. I loved everything about the furniture décor, the wallpaper, the bathrooms – perhaps I was a Hapsburg princess in a prior life! (Haha). Mozart played in the palace for the Queen at six years old at the Palace in 1762, which is crazy to think about. Europe is just full of such amazing history and I’m so glad we can visit these places that most people can only dream about. After the tour we headed back out to the beautiful grounds and walked around for a couple of hours. The grounds are open to the public to visit, so if you don’t want to visit the palace itself, the grounds are simply stunning. There are plenty of places to get lost and there were many people relaxing, having picnics and enjoying the view. We noticed a lot of the locals running through the grounds to get their daily exercise. I couldn’t help but think how lucky they were to have such a wonderful place at their doorstep every day. We eventually headed back to the station to pick up our bags and head to our hotel. By then it had started raining a little, so we had left just in time. I guess that is why Vienna is so beautiful and green! When we were trying to figure out where to stay over New Years, I certain hotel caught our attention. The 24 hours hotel was advertised as being circus themed. What the heck!? We had to stay there! Unfortunately as it was the holiday season it was a little out of our price range, so we had to give up on that idea. Thankfully for us, this time around it was much more reasonable and we were able to stay in our own little circus for around $100 for the night. The hotel did not disappoint! It was simply awesome. Everything was as wacky as you would imagine, I feel like 10 hipsters came together and designed this hotel while drinking cider, playing the accordion and grooming their large beards (does that tell you how hipster it is?) The shampoo in the bathroom was all natural (I actually ended up getting on amazon.de when we arrived back home and bought some). If I was to design a hotel, it would be like this place. Anyway, I will stop talking about it but it was absolutely awesome, the bed was incredible and you absolutely must stay there if you visit Vienna. Not to mention it was also walking distance to everything. Just look at the photos. You know you want to stay there now too! After getting settled into the hotel we headed out for a walk through the city. It was amazing how different it looked in the summertime. While it was beautiful in winter, it was truly something stunning in the summer. Everything looked so different surrounded by the beautiful gardens, flowers and greenery. I could absolutely live in Vienna. Perhaps it is due to the size of Austria and it’s scenery being so comparable to New Zealand, but with the added sophistication that being in Europe brings. One thing we didn’t get to do last time was visit the Hard Rock Vienna. By now, you all know my obsession of checking each one of them out. This Hard Rock was really impressive, albeit way more expensive than the Budapest version. The mac and cheese was absolutely on point, perhaps the best ever! I know, I keep saying that, but I really feel like this one was the best. 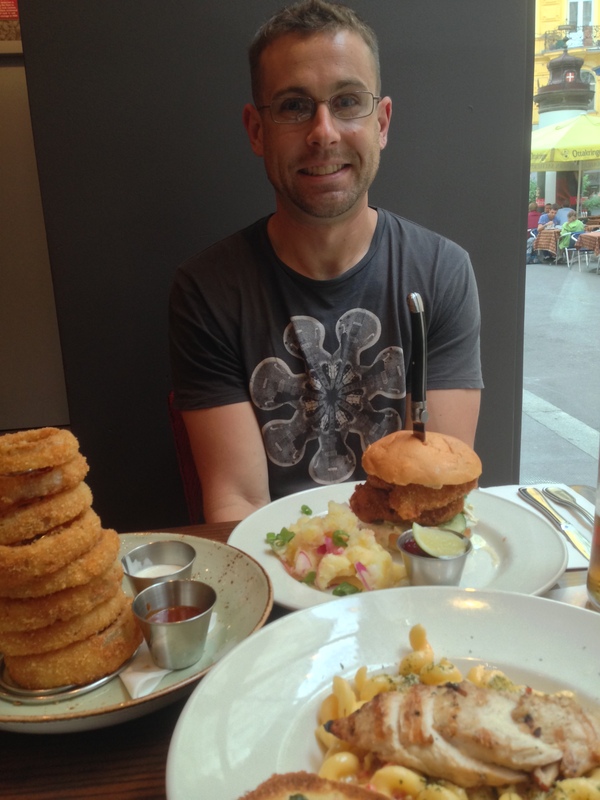 Nick had a delicious local legendary which was a wiener schnitzel burger with a kind of coleslaw and potato salad. Sounds weird but he was raving about it for a couple of weeks. After our bellies were full we decided to walk off the bloat by walking along the river. The lady at our hotel told us that there were bars set up along the river and they were made to be like beaches. As the weather had cleared up and gone back to being perfect and warm again, we decided that it sounded like a great idea. Sure enough, all along the river were bars in huts with sand that had been hauled in to make it feel like a beach. This was all the while against a kind of grungy graffiti filled backdrop. Again, it sounds really strange but Vienna made it work and it was such a cool vibe. We decided just to stroll along the river and enjoy the vibe of being in a landlocked country that is trying to make do with what they have. It was getting dark as we walked back to the hotel – taking the long way around so that we were walking around the Ringstrasse that goes around the whole of the inner city in Vienna. The boulevard we walked along was particularly beautiful with large streets, beautiful white grand buildings and large willowy trees. There were separate pedestrian and cyclist paths for safety, and to show you how busy the police are in the city they were pulling over cyclists to carry out bike inspections. That reminded me of New Zealand! As we were walking along we came across the Rathaus. When we had last seen the Rathaus it had the backdrop of New Years fireworks and waltzing couples. This time, it was almost unrecognizable with lush trees and rose bushes transforming it from it’s skeletal winter look. There was a film festival being hosted in the same grounds. Again, the atmosphere was buzzing. There were dozens of food trucks and hundreds of people sitting around enjoying their meals on their laps. They were drinking from proper glasses and cutlery – no worries about getting glassed in Vienna! One thing that we didn’t get to do, which was kind of the real reason that we were heading back to Austria, was see the Spanish Riding School. It turns out that July is the horses month off. Yes, the only month in the whole year that they are off and we were visiting at the very end of it. I didn’t find out until the day we arrived in Vienna that they had been having a daily show of the seasons foals. We missed out on that, too. I wonder why fate isn’t letting me see these horses?! Oh well. Next time then, I guess! If you are on the fence about visiting Vienna, then just go. It is so beautiful and it is a wonderful atmosphere.